The sun and moon are given especially for “. . . signs and seasons.” What you may have not known is that the word "seasons" in this particular verse does not denote merely what we call the four seasons of the year, but the word translated “seasons” is דיםְִמוֹע , mo’dim the exact same word used to describe “My appointed times” in Leviticus 23 and elsewhere in the Bible (these are seven Jewish festivals or feasts outlined in the Bible, which begin in the spring and end in fall, each year). So Genesis 1:14 is therefore, "They (the sun, moon, and stars) shall be for signs (things to come) and for appointed times." Lunar Eclipses, often referred to as Blood Moons, are 4 total lunar eclipses that occur in a row, also known as a tetrad. These Blood Moon tetrads are very rare! 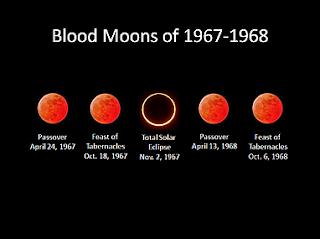 When they occur, the fully eclipsed Moon often takes on a reddish color which looks almost like blood! This is what is incredible, there have been 56 tetrads since Christ's day, however the last 8 have fell on the first and last of the 7 "feasts of the LORD" (Lev. 23:4; cf. Gen 1:14)! On God's "appointed times”, just like He said in Genesis 1:14! And not just have they fallen on the seasons (appointed times), but they have also been for signs (things to come)! Four TOTAL lunar eclipses occurred on the Jewish Passover and the Feast of Trumpets Holidays in 1493 – 1494. Only months after this tetrad, King Ferdinand and Queen Isabella of Spain ordered all Jewish people to leave the country! This was a pivotal event in history, the Jews were expelled from Spain. 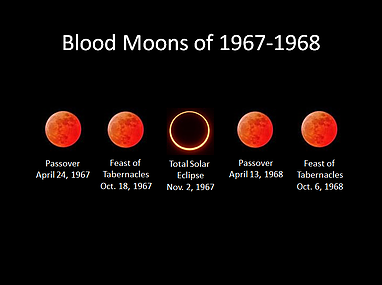 Four TOTAL lunar eclipses occurred on the Jewish Passover and Feast of Tabernacle in 1949 - 1950. These coincided during the 1st Arab - Israeli War for Independence just after Israel had become a nation again for the first time in 2,000 years. Even though Israel declared themselves a nation in 1948, the first permanent government took office on January 25th, 1949. The four blood moons (tetrad) coincided to the year 1949 for the first elected office of that year. And the rebirth of Israel a year earlier 1948. 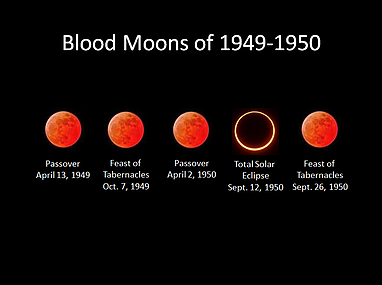 Four TOTAL lunar eclipses occurred on the Jewish Passover and Feast of Tabernacle in 2014 - 2015. The sign is yet to come! So in 1493 and 1494 the Jews were expelled from Spain. The blood moons in 1949 and 1950 came right after the nation of Israel was assembled, giving the Jews a homeland for the first time in thousands of years. And in 1967 and 1968 it was linked to the Six-Day War. If you think those are just a coincidence, what about the fact that these occurred on the exact feast day? These are beyond coincidences! God has timed it perfectly, and since we are witnessing this, we must look up and lift up our heads, because our redemption draws near.